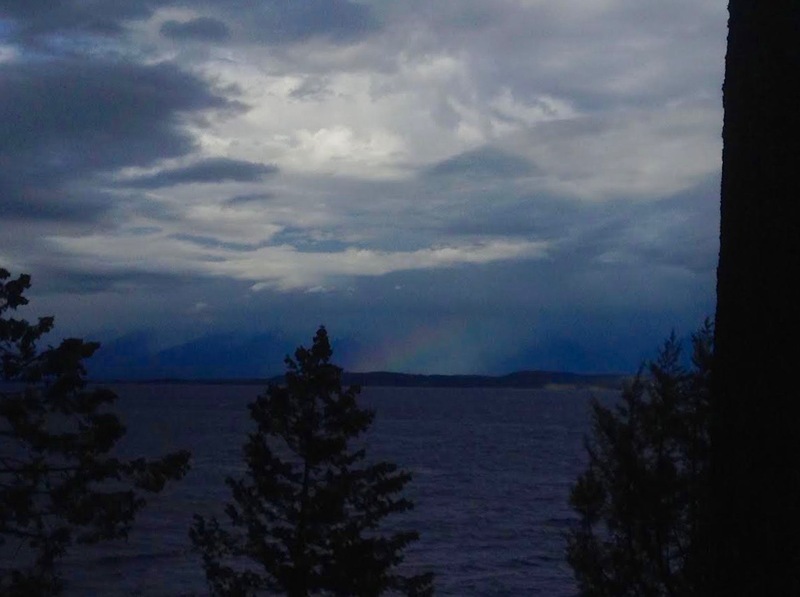 Two years in a row we have been fortunate to rent a place near Angel Point on the west shore of Flathead Lake. Staying in a single location for a few days, we can enjoy sunrise over The Missions and sunset in the forest, a waxing or waning moon, and the changing moods of the lake without having to sleep on the ground. 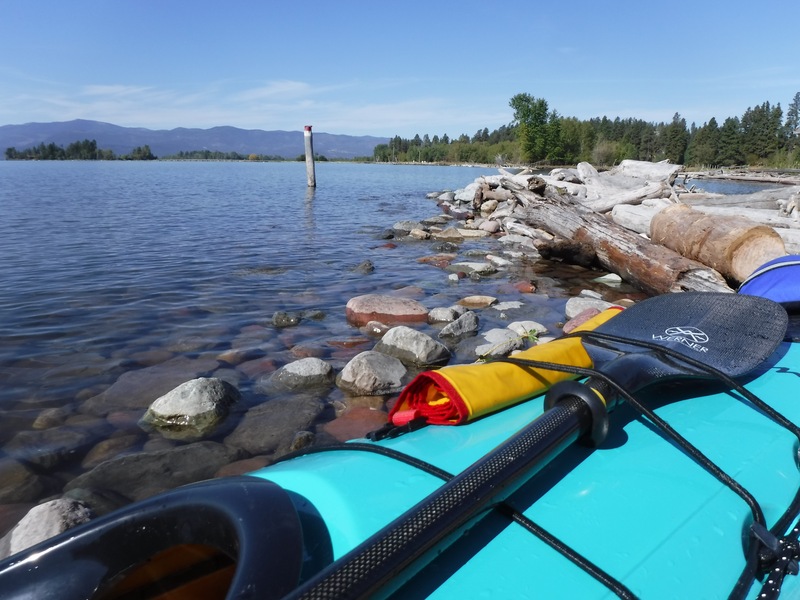 Even before we made these arrangements I held an idea in a back pocket: for a few years I have wanted to paddle the gap between Angel Point and the village of Bigfork in the northeast corner of the lake. When we arrived at the cabin we walked out on the deck to enjoy the view from elevation. In the distance we saw a dark storm system approaching from the north. It descended on the lake with a vengeance. Suddenly shore-side flags stretched taut as military sheets, trains of whitecaps and spray covered the lake, and within ten minutes six-foot waves began to crash onto the rocks and pour across the surface of docks. I did not have time to dig my camera out of luggage in the truck. We stood in awe of what the lake can become. Fortunately, my wife caught the aftermath with her iPad. Over the next few days we watched the energy from this autumn storm gradually dissipate and conditions improve. By timing my paddles to coincide with shifting wind directions, I was able to paddle to Somers in the north and Deep Bay in the south. On Thursday I finally saw my opportunity to paddle the gap, the six miles between the point and the far shore. I studied distant peaks above the Jewel Basin until I created a confident triangle between a single mountain, Bigfork, and my starting point. I packed a little food and two water bottles and lifted the boat off the dock and into the water. What if I am three miles from land and a storm arises like the one that we witnessed on Sunday? What if a big pontoon boat passes too close and casts a wave that rolls the kayak? What if an inattentive or inebriated speedboat driver does not see the flashes of light from my paddle? I worked to control the noise of these questions by concentrating on other things—my alignment in relation to the far shore, evidence of intermediate progress in the form of a yellow cottonwood leaf that had drifted down the river, a cluster of pine needles, or feathers from ring-billed gulls slipping by. I concentrated on smooth, efficient strokes, ones in which I applied force at precisely the right moment after the blade entered the water. I focused on posture. I pondered ways to enjoy the gap, taking pleasure in the sun on one cheek and wind on the other, a visit from what I think were long-legged kittiwakes that hovered above me, and then out of curiosity, settled beside me before flying away. Distant fishing boats drifted past the curvature of the earth or disappeared into shore-side shade. Though I choose another way, I managed to enjoy the sounds of well-tuned engines and a small plane overhead. In a sense paddling the gap is a meditation on calling the mind back from its fears to the qualities of the present moment. In good time I passed the river delta that extends about a mile and one half into the lake, saw details sharpen, and came ashore opposite a humble cabin made of recycled materials. The owners had created a large heart shape by piling round stones into a pattern that left the center full of water—a beating heart. I ate a snack, drank water and used my cell phone to reassure an anxious spouse. After creating another triangle between my eyes, a spot somewhere just north of Angel Point and a distant hill I settled into my return, committing myself to shorten the long hypotenuse. Crossing the gap again I reflected on other gaps in our lives—the gap between loneliness and friendship, the gap between illness and recovery, the gap between a fossil fuel economy and one built on renewable forms of energy. I let my imagination consider the terrible gap between addiction and sobriety, indebtedness and solvency, conflict and reconciliation, complaint before the court and a long-awaited just decree. In truth we live in the gaps, somewhere between setting off in relative uncertainty and the suddenness of arrival. Entering a gap seems vastly different than paddling near shore. For a long time we see no evidence of progress. We have no passing cliff or boathouse or tree by which to measure our advance; we have only the distance to measure, miles in the gap that seem not to close. Paddling offers practice for the larger process and never seems like an end in itself. For the other gaps in my life I gain strength at binding the mind to the present, controlling anxiety, learning to enjoy something as seemingly small as a leaf floating on the surface or a bubble rising from the sediments below. When I finally reached my original starting point I lifted my boat out of the water, pulled it up my thighs, then lifted it onto my right shoulder. I carried it up the steep steps leading to the driveway and set it in the cradle atop my wooden rack. I cinched down the straps realizing that it would be a long time before I paddled again. Other autumn commitments and then winter will stand between me and my boat. I felt sad knowing I had completed the last paddle of the year. Another gap has appeared. It seems difficult to cross the distance, but I remind myself I have had practice living in the gaps.